The Popular Summerhouse combines a minimalist design with great functionality. The double doors provide ease of access, while glass to ground glazing and two sets of front windows let in plenty of light to create an airy atmosphere. This building comes in 6 sizes with a selection of optional extras such as a painted finish and toughened glass. 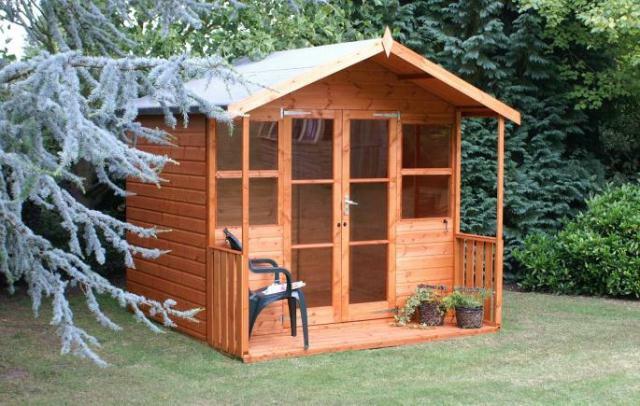 The Popular Summerhouse suits most gardens and is available with an optional verandah. It comes in 6 sizes with a selection of optional extras such as a painted finish and toughened glass. The Popular Summerhouse has a range of extras available including, but not limited to, toughened glass and no less than 32 different paint finishes if required. The Popular Summerhouse suits most gardens and is available with an optional verandah this is shown in the picture. It comes in 6 sizes with a selection of optional extras such as a painted finish and toughened glass.